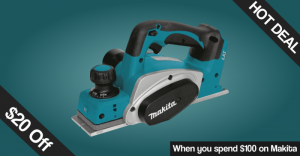 $20 off $100 Makita orders. From February 1, 2017 through March 15, 2017, get $20 off select $100 Makita Tool orders from ACME Tools. Use promo code MAKITA20. The deal is limited to select Makita products, and there are currently 51 tools that qualify for the discount. This deal is also available on Makita Tools that are shipped and sold by Amazon (not a 3rd party seller). The discount automatically applied at checkout. Buy from Amazon.